Yes, Hillary Clinton lost the election, and yes she took some long walks in the woods after that devastating loss to a megalomaniac. But she’s back, spreading the divine words of feminism and truth through public appearances and what I can only assume is one brilliant millennial media woman running her Twitter. And one of her most recent Tweets was snarkily brilliant, and beyond necessary, simply posting, “Right here. Includes radical provisions like how not to kick 23 mil ppl off their coverage. Feel free to run w/it,” followed to a link to an in-depth layout for a comprehensive healthcare plan on her website. So since the hapless idiot in office and his handmaid’s tale chorus line can’t compose a healthcare plan to save their dicks, let’s let someone without one explain what needs to happen. The post has a soul-crushing back bite of course. 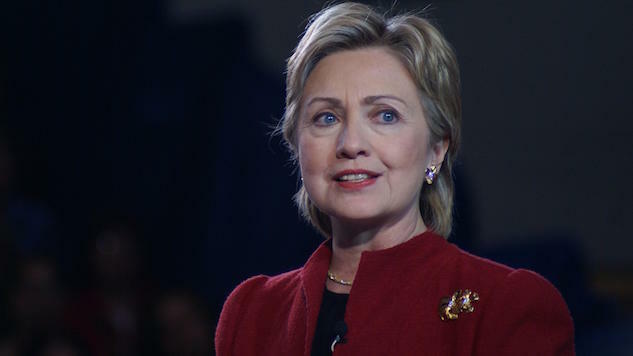 It’s was originally published during her time on the trail, begins with “As president Hillary will,” and includes campaign speech quotes from 2015—you know, back when hope was a real thing and women weren’t skipping lunch to have IUD’s implanted because our access to reproductive healthcare might disappear. It’s a specific kind of pain, because if it wasn’t for misogyny, some emails and one letter from one white dude, we would have comprehensive ACA reform by now. So what does Hillary suggest? She comes out of the gate with expansion of the Affordable Care Act, as opposed to the GOP obsession with full repeal. Clinton’s plan would hope to grow and strengthen the ACA by keeping the twenty million plus people insured through the law within the system, and allowing even more people to enter the pool through a “public option,” which would presumably be for those who don’t make enough to qualify for tax credit subsidies. Beyond that she planned to address the real problems plaguing the Affordable Care Act, which are not so much the language of the law, but the way in which insurance carriers and pharmaceuticals systemically abuse and control the American healthcare system. First by reducing premium and out of pocket costs, which since the ACA have sky rocketed as a way for carriers to recover claims losses from having to take on those with preexisting conditions. Clinton also promised to address soaring prescription costs. Drug patent law reform would be step one, while also increasing penalties for drug companies unjustifiably increasing drug costs. She also proposed new enforcements for making generic drug alternatives available for financially struggling patients, and allowing treatments from other countries with strong safety standards to be legal—as currently the FDA does not allow prescription imports. Seeing as Republican law makers have absolutely no interest in addressing big pharma’s lobby-won choke hold over the American medical system, Hillary was already a world above by making drug reform part of her campaign platform and a core block of her ACA reform plan. Most importantly, Clinton wanted to incentivize states further to expand Medicaid, which covers those who cannot afford health coverage on the Marketplace or meet the minimum income requirements for subsidies. All states not expanding Medicaid when Obama first signed the ACA into law is part of why the system is not imploding. By contrast, republicans now are suggesting that they will cut Medicaid drastically, and give states more power to go against the federal law and make state-by-state healthcare regulations, further destabilizing and fracturing the system. Clinton also vowed to expand rural access to medical facilities, something that as a person who badly needed stitches once on a rural canoe trip, when the closest hospital was an hour away, can vouch is sorely needed for Americans who chose to not live in urban areas. We shouldn’t regionally deny care, it’s elitist. On top of that, Hillary also assured that she would protect affordable and easy access to female reproductive care, explicitly stating she would preserve, “access to preventive care, affordable contraception, and safe and legal abortion.” Republicans on the other hand still refuse to even say the word abortion, because moderates are too big of pussies to defend our right to it, and the far right are too busy knitting baby booties in the dank conservative closet for our future federally mandated white nationalist baby factories to even consider such a thing. It’s laughable really that Clinton has such a realistic, feasible and comprehensive plan laid out on her website from before the election, and here we are over six months after inauguration and the convening of this Congress, and there isn’t even a plan on the table. Hillary was right when she said, “feel free to use it.” But really what we should be saying, is please, Republican Senators, for the love of the Christ you hold so dear, use it. Chloe Stillwell is a Nashville-based columnist focusing on politics, culture and feminism.